Enter your email and receive an immediate download link, along with even more printable free Kids Bible lessons and activities twice a month. Experience the convenience of having printable activities for top Bible stories, including, Noah's Ark, Jonah, David and Goliath, Daniel, Esther, Deborah, Jesus' Death and Resurrection and more! Packed with puzzles, crosswords, mazes, and wordsearches, this free download features 10 reproducible activities that will keep kids actively engaged as they learn about top Bible stories. Sign me up and send me the free Kids Bible Activities and eNews! Thank You! A confirmation email is on the way! 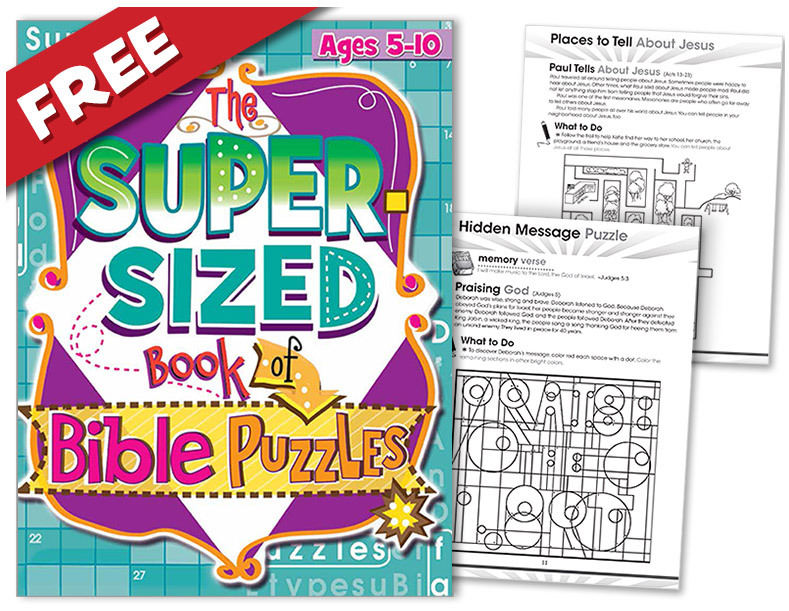 FREE: Receive an immediate email with a link to your free Bible puzzles download. FREE: Twice a month get a link in your email to more free kids Bible lessons, activities, crafts and much more! Upcoming topics include: Fruit of the Spirit, the Good Samaritan, the Ten Commandments, and more! SAVE TIME: Each lesson is fully-reproducible! Print copies for Sunday school, kid’s church, homeschool, VBS, and more! SAVE MONEY: We'll also email you information on similar products you might like, as well as exclusive deals and special savings on all our Kids Bible activities, lessons and devotions! Simply print and go! Each activity page features a scripture verse, brief Bible story, and puzzle that will stretch kids' minds as they learn about the Bible! Easily use these activities before, during or after your lesson! Perfect for children ministries leaders and parents (Appropriate for kids ages 5-10). Enjoy having 10 reproducible activities at your fingertips! Kids will learn important lessons as they find out more about Noah's Ark, Jonah, David and Goliath, Daniel, Esther, Deborah, Jesus' Death and Resurrection and more! Easy-Prep: Simply Print and Go! This free download is fully-reproducible! You can save it to your computer, print it, and even photocopy as many copies as you need! Easily use them before, during or after your lessons.